It is Korngold at his best. HKO ja John Storgårds ovat elementissään viihteellisen kujeilevissa ja romanttisen laulavissa tunnelmissa. Äänitys kirkastaa hyvin Musiikkitalon mattaista akustiikkaa. 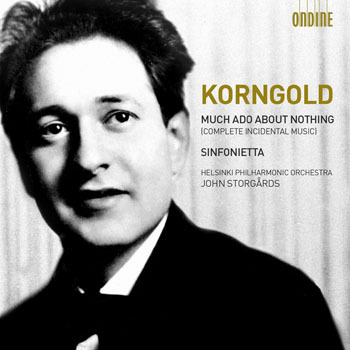 This release of Erich Wolfgang Korngold's Much Ado About Nothing and Sinfonietta follows Ondine's release of the Symphony in F sharp and the Tänzchen im alten Stil (ODE 1182-2). The complete incidental music from Much Ado About Nothing (Viel Lärm um Nichts) is a world première recording. It was premiered in 2012 under the direction of John Storgårds. Originally written for chamber orchestra, it is performed here by symphony orchestra. The Sinfonietta was first performed by Felix Weingartner and the Vienna Philharmonic Orchestra. Richly orchestrated melodies, dreamy music and an imposing finale characterize the work. John Storgårds, one of Finland's most exceptional artists, has built a worldwide reputation in recent years. Storgårds is Chief Conductor of the Helsinki Philharmonic Orchestra and was appointed Principal Guest Conductor of BBC Philharmonic Orchestra in 2012.